ENL Wiki » Maximizing Gains » Optimum Quantity for a Final Output: How Much Bread? If we are trying to maximize gains, the most basic task is to determine the optimum quantity for a single final output, such as bread. Remember that ENL is intended to provide broad economic guidance only. Thus, to determine an optimum quantity does not mean to calculate a precise number, but to produce an estimate that is sufficient for such social direction. The specific numbers below are intended for explanatory purposes only. Imagine that we are members of a small, self-contained economy. There is by assumption no trade, so all values and costs are experienced by the members themselves. Our task is to decide how many loaves of bread our economy should produce so as to maximize the resulting health. Fortunately, this society is perfectly democratic, so there is no political or other interference with our choice. What method should we use in making our decision? The correct approach is to use marginal analysis to determine the optimum number of loaves based on the current value and cost curves for this final output. The optimization rule is straightforward: increase the output's quantity until its cost is equal to its value. The first type of value to consider in implementing this rule is potential value: the maximum capacity of a loaf of bread to increase our health. Let's say this capacity is 100 health units. Potential value is defined as a maximum capacity because it assumes perfect consumption conditions, no matter how much is produced and consumed. The bread's potential value of 100 health units is thus a constant number. Potential value is the necessary starting point for this analysis, but it is only a potential — considered by itself, it has no effect on health. The realization of this potential, which will determine the actual health our society will gain from bread consumption, depends on the attainment of effectual value. This is the result of three factors: the destruction of bread that may occur through output losses, the bread’s distribution, and the satiation we experience when it is consumed. Maldistribution and satiation are directly related — as the first gets worse, so does the second. Because we are imagining a more or less ideal situation, let's assume that output loss is very low, and that distribution is perfect. A few loaves are destroyed in production, a few others are crushed during delivery, and some are left on the shelf too long and get moldy. However, most of the loaves survive, and these are consumed by people who can, and do, extract the maximum amount of effectual value from them. Let's assume that, under these conditions, the effectual value of the loaves starts at 95 units. If the pattern of distribution remains unchanged as more loaves are produced, and if satiation does not occur, then 95 units will be a constant quantity, and we should continue to produce loaves until cost rises to this level. However, satiation will inevitably occur — this is an unavoidable consequence of all consumption. Thus, even with perfect distribution, the effectual value resulting from our bread consumption will decline, although the rate at which this occurs is entirely an empirical issue. Now let's consider the cost side. The only "true cost” in ENL is input cost. The so-called opportunity cost of standard economics, which in ENL is called forgone health, addresses allocation instead of production. Here we are focusing on production, after our society's allocation decisions have already been made. The input cost to be considered refers to the bread's entire life cycle. Producing bread involves a lot more than just putting dough in ovens — it entails a whole string of prior activities, including the production and transportation of flour, yeast, salt, sugar, additives, and packaging. After the bread is consumed, the packaging must be recycled or discarded. The facility that produces the bread must initially be constructed, then serviced and maintained, and eventually dismantled. The labor cost and natural cost for all these steps must be included when estimating the bread's input cost. Let's assume that the labor required to produce small quantities of bread consists of healthy activities, but that there is some natural cost associated with this production. The input cost of the initial loaves is therefore quite low — let’s say 10 health units. Input cost tends to rise as output quantity goes up. As bread production increases, it might turn out that, when production reaches 10,000 loaves, the effectual value derived from a loaf of bread has decreased from 95 to 55 units, and its input cost has increased from 10 to 55 units. This means that, for the next batch of loaves to come out of the oven, input cost will be greater than effectual value. In other words, if we bake more than 10,000 loaves, our society will lose more health from producing the next batch than will be gained from its consumption. This is clearly irrational given our aim of health maximization, and production should therefore stop at this number. What we have just done, using informal terms and fictitious numbers, is to establish the optimum level of bread production for our society. Although many practical issues must be resolved before such an estimate can be made in a complex environment, this is the heart of the rationality we should strive to achieve. This procedure is not new with ENL. Standard economics has for many years used the method to optimize a firm's activities (i.e., to maximize its profits) by equating its marginal cost with its marginal revenue, expressed in money terms. What is new here is that this well-established technique has been applied to the basic human realities of health gains in consumption and health losses in production in order to reach a preliminary conclusion about the rational quantity for a final output. The following graph depicts the situation just described, specifically the case where production goes beyond the optimum output of 10,000 loaves. The potential value and labor cost curves are omitted. 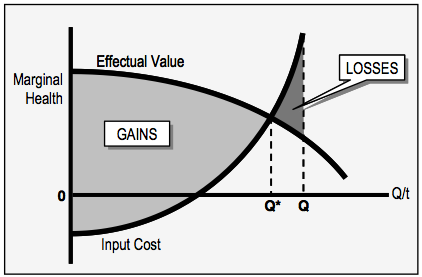 Current output quantity Q is greater than the optimum quantity Q*, and losses are therefore incurred. Production should decrease from Q to Q*. In ENL, "gains" is a formal term. 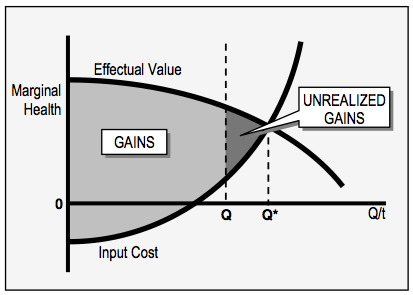 Gains arise when the effectual value from consuming an output is greater than its input cost. Here this is true for quantities between 0 and Q*, and the gains achieved are therefore represented by the light-colored area at left. Losses are incurred when the situation is reversed — when input cost is greater than effectual value. This is true for quantities between Q* and Q. Losses are thus represented by the dark-colored area at right. The gains and losses depicted here apply to everyone within the geographical scope of our analysis. All people in this area are treated equally, which means that a health increase from consumption by one person is offset by a health decrease from production by another. To determine the overall health effects from the situation shown in the graph, we must calculate the net gains, defined as the difference between gains and losses. For example, if the gains area at left represents 50 health units and the losses area at right represents 7 units, the net gains are 50 – 7 = 43 units. In general, losses are incurred whenever an output is overproduced — that is, whenever the current quantity is greater than the optimum quantity, as in the figure above. Whether such losses result in net gains or net losses depends on the actual numbers involved, so no general statement can be made. Net gains arise in this case because the gains (50) are greater than the losses (7). If output quantity were to increase so that losses rose to 60, the result would be net losses. The losses shown above can be reduced by decreasing output quantity. It is clear from the diagram that if the current output quantity goes down, the losses will go down as well. However, if this decrease goes too far, the error of overproduction will turn into the error of underproduction. This is shown in the figure below. Production is less than the optimum quantity, resulting in unrealized gains. Production should increase from Q to Q*. Here the current quantity is less than the optimum quantity, resulting in too little output, or underproduction. Outright losses are avoided, but some achievable gains are unrealized. These unrealized gains are represented by the dark-colored area at right. If we assume that this area represents 7 units of health, output quantity Q results in the same net gains as in the previous situation: 43 units. Although this demonstration is by no means rigorous, it should be apparent that health is maximized, and output quantity is therefore optimized, when the current quantity is precisely Q* — the output level where marginal input cost equals marginal effectual value. This is shown in the figure below. Production is at the optimum level when marginal input cost equals marginal effectual value. Because there are no losses or unrealized gains, health gains have been maximized. In this situation all achievable gains are realized and no actual losses are incurred. 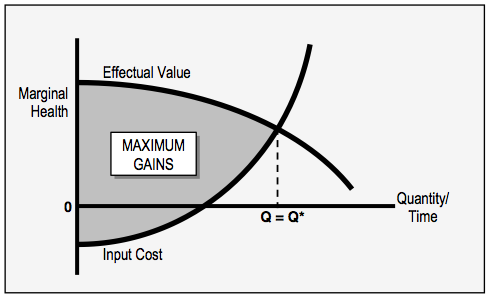 The net gains of 50 health units are the maximum possible given the effectual value and input cost curves shown. In the short run, therefore, this is the optimum quantity for this final output. Unless the value and cost curves are modified in the long run, no greater health can be achieved by this output than this ideal quantity. The above diagrams demonstrate that both overproduction and underproduction are sub-optimal in that they fail to maximize health. In a capitalist economy, underproduction typically occurs when outputs are predominantly consumed by the poor, who cannot adequately back up their demands with money. Overproduction, on the other hand, typically occurs when outputs are predominantly consumed by the rich, who have the financial resources to purchase what they desire, thereby shifting input costs to those with fewer means. This should remind us that equity issues are masked when dealing with aggregate quantities, and therefore ENL offers additional methods to address these. In general, underproduction is better than overproduction for the economy's overall health results because underproduction uses fewer inputs. This leaves unused inputs for allocation to other outputs, and causes less damage to the environment. Thus, if a choice must be made between overproduction and underproduction, the latter should normally be preferred. A critical point is that an output's optimum quantity is also its economic limit. That is, under current value and cost conditions there is no conceivable economic rationale for increasing the output's quantity beyond this point. The consideration of ecological limits might decrease the rational output level in subsequent analysis, but no economic reason can be cited to increase it. However, we must be careful to avoid what might be called the "rich environmentalist" perspective, which sees excess everywhere and strives for reduced consumption across the board. 1. Narindar Singh, Economics and the Crisis of Ecology 3rd ed. - Revised (London: Bellow Publishing, 1978), 229. 2. Marx alluded to "enoughness" 140 years ago: It is… clear that in any given economic formation of society, where not the exchange-value but the use-value of the product predominates, surplus-labour will be limited by a given set of wants…" Karl Marx, Capital: A Critical Analysis of Capitalist Production (Moscow: Progress Publishers), Vol. 1, 226. Volume one was first published in 1867. 3. George Orwell, Homage to Catalonia (Hardmondsworth: Penguin Books, 1938), 244. The essay is included at the end of the book.